Nigeria's Islamist insurgency on Monday kidnapped some 20 girls just miles from a small town where the group abducted several hundred schoolgirls in April, local officials said, in an attack that exposed the military's absence in an area the president pledged to protect. The village of Garkin Fulani was preparing for its weekly market early Monday when Boko Haram fighters pulled up in a tractor trailer and began pulling young girls into the truck, said Adu Ibrahim, the area's chairman for a vigilante group called the Civilian Joint Task Force. The village straddles the same dirt road that leads to Chibok, a small and remote town where Boko Haram kidnapped 276 schoolgirls in April. The area is the heartland of the insurgency, which has flourished over the past five years despite government efforts to suppress it. The attack was the latest reminder of how vulnerable the northeastern corner of Nigeria has become, despite President Goodluck Jonathan's declarations of war against Boko Haram. The country's military was nowhere to be seen during the hours long raid, said a member of the state government there. Instead, the job of preventing more kidnappings has fallen to a group of vigilantes who say they have been left with only hunting rifles, fashioned from car parts and scraps of wood, to go up against the rocket launchers and heavy machine guns of Boko Haram. The Nigerian government couldn't be reached to comment about Monday's incident, but it has maintained that its military is performing valiantly. For five years, Boko Haram has perpetrated devastating attacks: It has bombed government buildings, torched schools, broken open jails, abducted hundreds of young men and women, shot up churches and decapitated Muslims and Christians alike. On April 14, it kidnapped 276 teenage girls from their boarding school, an attack that at the time looked as if it might prove to be a turning point in the government's campaign. At least 53 of the girls immediately escaped, bringing back horrific stories. In the following days, Offers of military help poured in from foreign powers. To find the girls, the U.S. has said it is dispatching drones over Nigeria along with 80 soldiers who will guard a drone base in neighboring Chad. The U.K. has sent a surveillance plane, while China is offering satellite data. France is gathering intelligence from the French-speaking nations that border Nigeria, its government says. Nine weeks later, none of those world powers have confirmed any breakthroughs in the search—in fact, the relationships show signs of strain. U.S. officials have cast doubt on Nigerian military announcements that the girls have been found. In turn, several senior Nigerian politicians have expressed their discomfort with Nigeria—historically, a nation that hardly takes in aid— accepting U.S. military assistance. Meanwhile, the number of girls Boko Haram holds hostage has risen. On May 5, suspected Boko Haram fighters kidnapped at least eight girls from two villages near Chibok, Amnesty International said. 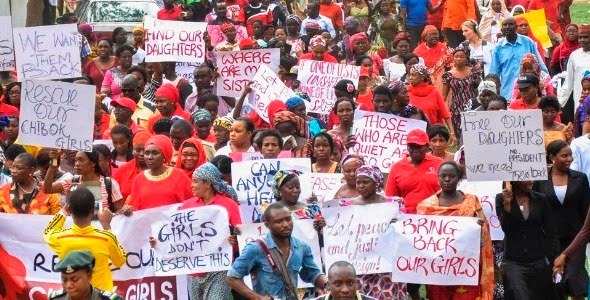 On Saturday, the group kidnapped two older women, roughly 60 years old, from another village outside Chibok, said Adamsi Mohammed Tar, a local vigilante leader. "We are still searching the bush," said Mr. Tar, who said his men, armed with muskets, killed 17 Boko Haram fighters on Sunday, when they caught them sleeping under a mango tree. It wasn't possible to confirm his account. The insurgents often attack villages on the days when they host traveling markets. Such attacks allow the group to stock up on provisions and take hostages who might be ransomed later, or swapped for Boko Haram prisoners. On Monday, Boko Haram fighters loaded the truck with abductees along with rice and instant noodles, said Mr. Ibrahim, the vigilante leader. "These people have a free hand to do whatever they want," said Jibrin Ibrahim, the director of the advocacy group Center for Democracy and Development's office in the capital Abuja. "It's just that simple." —Emmanuel Julius in Maiduguri, Nigeria, contributed to contributed to this article.